I was ambushed, caught off guard. After a splendid and wine-intensive meal at Polpo in Soho the previous night, I wandered out of the hotel near Tower Bridge into the overcast morning in search of coffee. After a few steps I spotted an 'Eat' and headed towards it, only to find myself on a familiar road. Barriers on either side, a pulsating vaccuum pulling me west ... 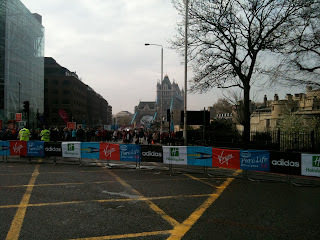 I was crossing the route of the London Marathon. I fell to my knees and wept. Then I moved quickly to avoid the cyclists who were following the route long before the race started. After breakfast we headed back to the route to watch, and found a good spot where we could see the runners after they turned right after Tower Bridge, at 13 miles, and then again as they headed back, at 22 miles, towards the finish. My hamstring felt just fine, and I wondered if I could have done it. But it was a nice spot to watch from, and a good way to spend a morning. We saw the wheelchair race, then the elite women, then the elite men, then the masses; then we saw them all again, their journey almost done. I spoke to a guy leaning on the barrier next to me, with a fold-up bicycle. His PB was 2:52. 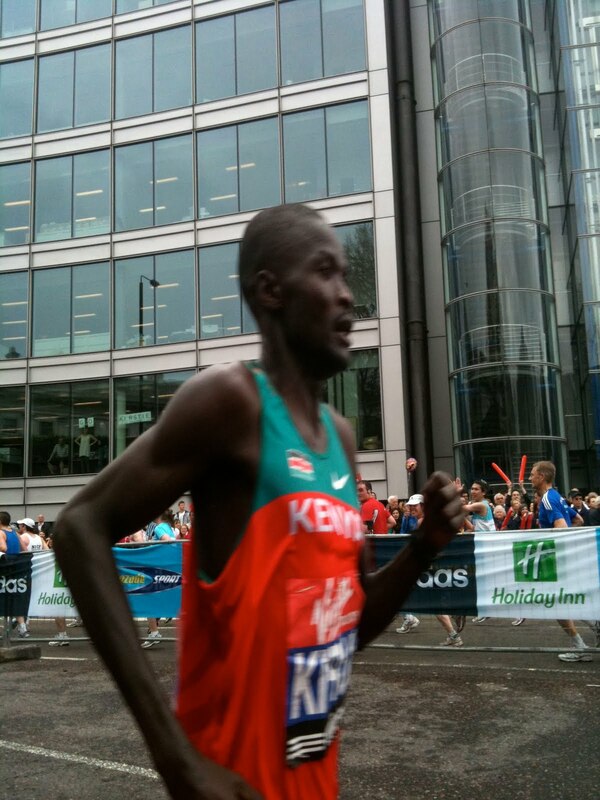 I saw Tsegaye Kebede, with a pack at 13 miles, running alone and strong at 22 (he won in 2:05.19). 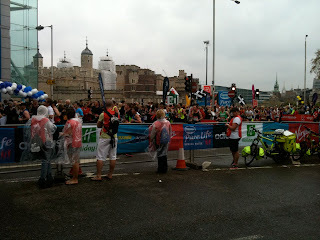 I saw, amidst the mass runners, Fergie, Simon, Pietro, Alessandro, all former training partners. I saw a giraffe, a mosquito, and many superheroes. 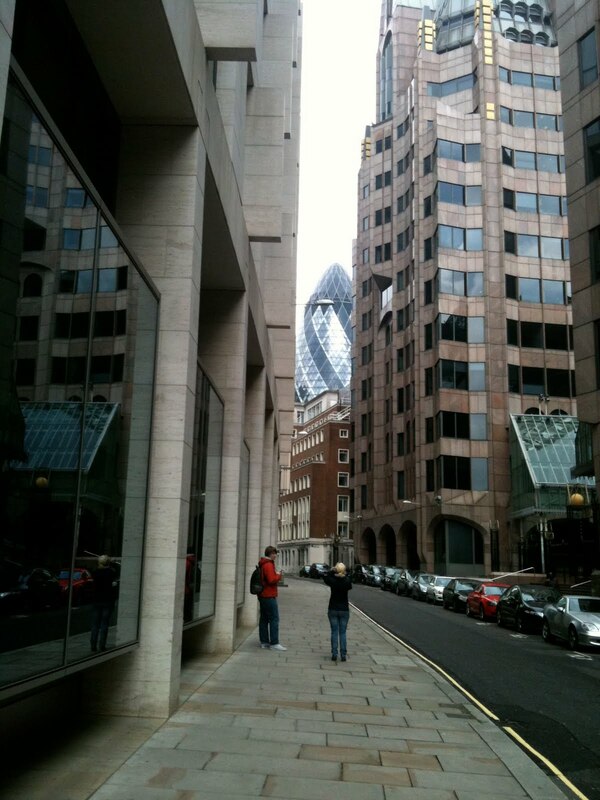 Then we wandered off and had lunch in the shadow of the gherkin. I walked across London, faster than the tail enders. The Cambridge and Coleridge Athletic Club (which has a fancy new website) met at Chandos, a pub near the Mall, and I drank some beers with the runners, all pretty gloomy except Fergie who'd knocked five minutes off his PB, running 2:52. 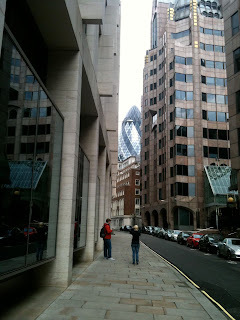 Then I walked some more, the sun now out, and London felt very small. And that was the 2010 London Marathon. I found myself empty of words, no longer able to turn running into them. Perhaps the blog has reached its natural end. I wanted to find a way of writing about something that was not about language, about a feeling that was hard to translate into ideas (and all the more so when I read Murukami's disappointing What I talk about ... which didn't seem to describe it at all). I still do: I would like to write a book about running, not the history of running (like John Bryant's various books), not the stats and the practice (ever read The Lore of Running? it's been done), but a book that used the culture of running as a way into describing the experience, the raw thing of what it feels like when you're lost inside a long run on the road, along the river, over a hill. But here I am, not running, but riding instead, and learning the much more material and mechanical business of how to realign your derailleur when, on a long ride, your gear keeps slipping, learning about riding in a group, learning about clothing to protect against the wind, and learning about a very different kind of loneliness. Much too young to call it a day. I only began at your age Joad and look what happened for me ( on second thoughts: Don`t. But look how it inspired your running colleague: my son. Joad, I stumbled across your blog today looking for a link to the Robert Frost poem. You write beautifully about running. I was going to read Murakami's book (I'm a fan of his other writing, bizarre as it can get) but now I wonder if that would be the final straw for me and him.